At What Age Did You Begin Wearing Correction? At age 6, I began wearing glasses and at age 17 I started wearing contacts. What Was Your Biggest Complaint About Glasses or Contacts? The biggest complaint I had about glasses and contacts would have to be the inability to function and perform daily activities. I felt “disabled” by my poor vision. How Has LASIK Made Your Life Easier? What hasn’t been easier since having LASIK? LASIK has turned my blurred mornings into clarity. I have the ability to wake up in the middle of the night and not have to stumble to find my glasses on my night stand. My family has noticed how happy I have been since having my procedure. What Would You Tell Your Friends About Having LASIK? I wish I would have done it sooner! When you think about your health and the resources that are available, you often think of a price tag that is involved with it. Indiana LASIK Centers has so many affordable options available, all you have to do is call them! Would Your Recommend Indiana LASIK Centers To Others? I would definitely recommend LASIK to others! It has been a life changing experience and I enjoy sharing my story and my progress with others. 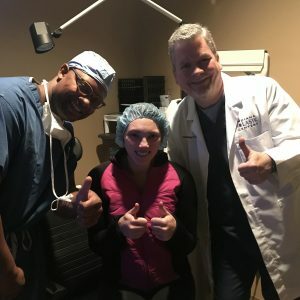 I am so glad I decided to pursue LASIK!